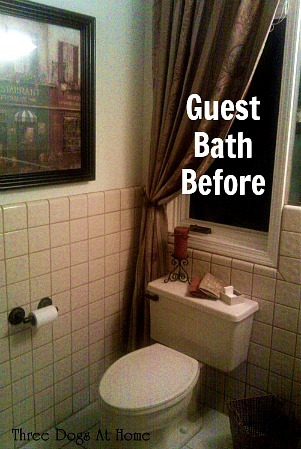 Traci wrote me about her Guest Bath Makeover and says she started with “classic 1980’s yuck.” But now? “I’m so happy with this room remodel that I smile each time I walk by it. It was absolutely worth the six months that we spent working on it.” Keep scrolling to see how it looks now! 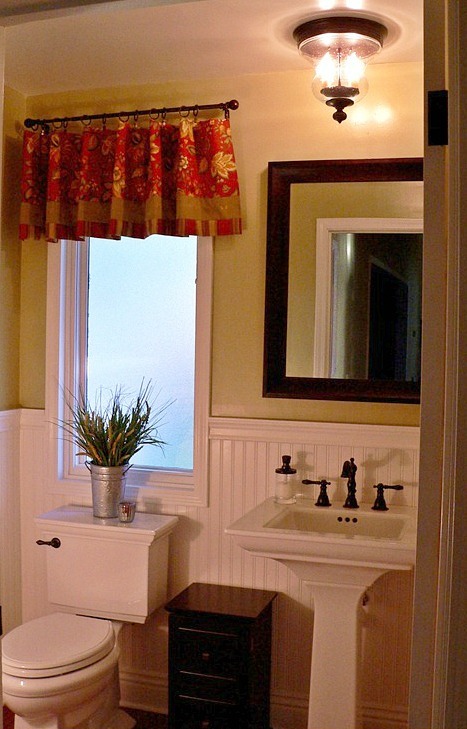 The beadboard paneling gives the room a fresh look it just didn’t have with the old tile. Visit Traci’s blog Three Dogs at Home for all the photos and details. My biggest pet peeve HAS to be those dinky, little pedestal sinks like in the “before” — every other bathroom on House Hunters has one, I swear! Kudos to Traci for picking the chunky, square sink + matching toilet (from Kohler? ); I’ve always loved those! I had that exact sink in my last house. I think they sold a lot of those to builders over the years! Ha. 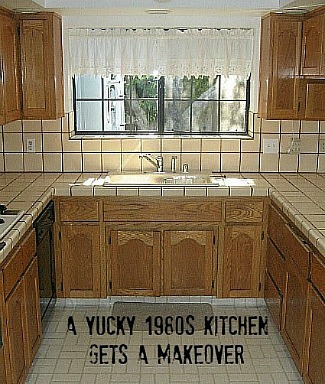 What a great reno! 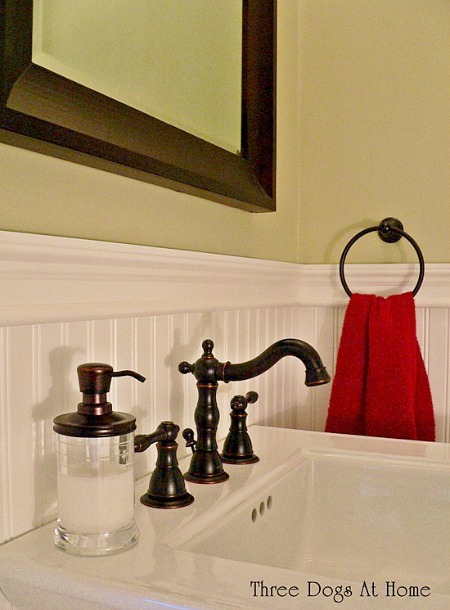 I love bathrooms with beadboard paneling. Doesn’t it add so much to any space? 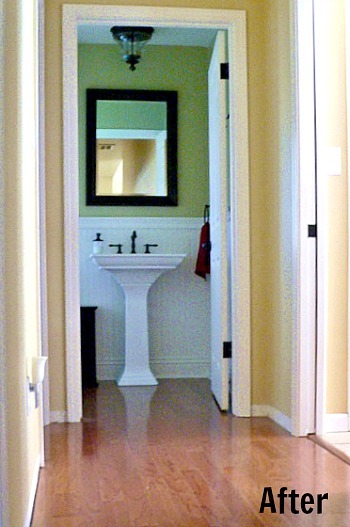 I’m inspired to add beadboard to our basement bathroom reno. I love the look!! I am so glad that you like the beadboard, Luciane. I am hoping to add some to my kitchen one of these days. You can check out the post where I detailed the installation here https://threedogsathome.blogspot.com/2011/09/beadboard-in-bath.html. Thanks Alie, but it was pretty ugly. I am so glad you noticed the moldings, we are changing or adding them one room at a time. I actually had a great time adding the beadboard. My secret is paintable caulking and lots of it. You can check it out here https://threedogsathome.blogspot.com/2011/09/beadboard-in-bath.html. Just lovely! So fresh and up to date 🙂 I am a HUGE fan of beadboard too! 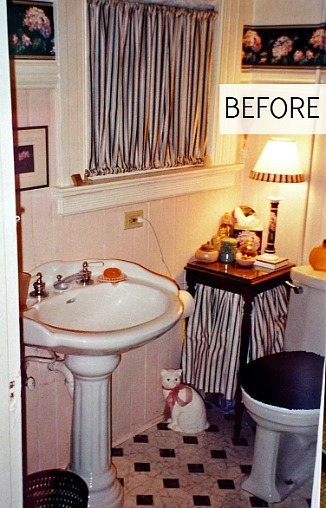 I love your discription of my powder room, that was exactly what I was going for in there. It was actually easy to install. 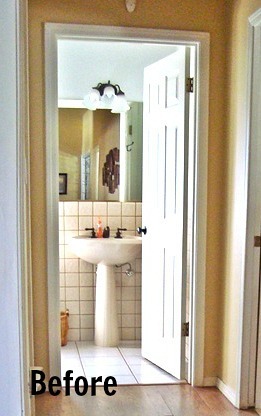 You can check it out here https://threedogsathome.blogspot.com/2011/09/beadboard-in-bath.html. Do you have any beadboard in your home? What a transformation. Love the new bathroom. I just can’t figure out why it took six months to do. Maybe from start of the idea process to completion? If that’s the case, it would probably take me a lot longer. I always seem to get stuck in the decision process — I like too many styles! Thanks for your sweet words Carol. The only delay was because I couldn’t find a light I liked. We don’t have the best shopping choices here. It was one of those projects where in order to do the bathroom we needed to start with the floor and the flooring was connected to the hall, the dining room and the entry way. Then there where problems at every turn but it was worth the wait. Looks very nice, but I wondered as well, why 6 months? Did they come across unexpected problems during the process? I am not a fan of any style of pedestal sinks, but I really like the bead board, which can look very nice in a kitchen as well. Getting rid of the tile on the floor and wall made a huge difference! Everyone had the same question about why it took so long. 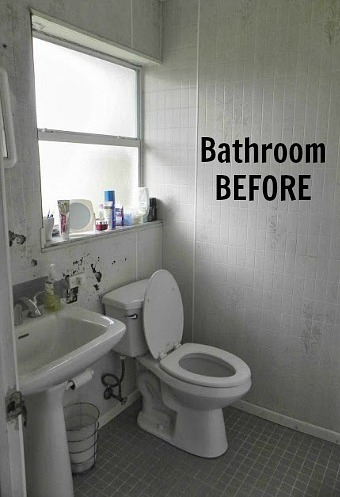 In order to do the bathroom we had to rip up and replace all the flooring and baseboards in a large part of the house. We also ran into several problems, we discovered a leak in the outside wall that had damaged the wall and insulation so we had to have a plumber in to fix that and move the pipes to behind the pedestal along with a few more snags along the way. I wanted to use an old dresser as a vanity but I was never able to find one that worked so the pedestal sink was a compromise. Hi Julia. I am thrilled to have my powder featured on your blog. Six months does seem like a long time to work on a 5 x 6 ft room but because the bathroom floor was connected to the hall which was connected to the dining room and the entry hall totaling about a 1000 sq. ft. it seemed to take forever. We ripped out and replaced all the flooring and moldings along with all the work in the powder room. And it took me forever to find just the right light fixture. Since we did all the work ourselves it did take longer than if we had hired a contractor, but where is the fun in that. I would, personally, give my right hand for the ‘before’ in our house right now, given we’re renovating the world’s most rundown farmhouse (the current bathroom is terrifying). The finished result looks great, though – love the tapware.